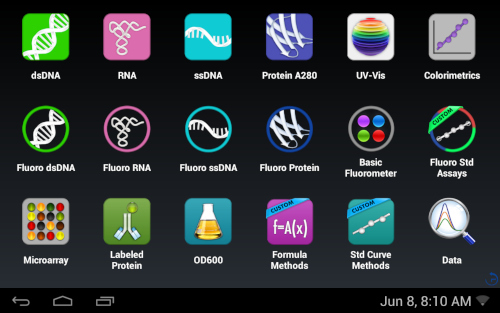 The DS-11 FX Series instrument rapidly quantifies over seven orders of magnitude of nucleic acids and protein samples selecting your choice of UV-Vis or Fluorescent modes. 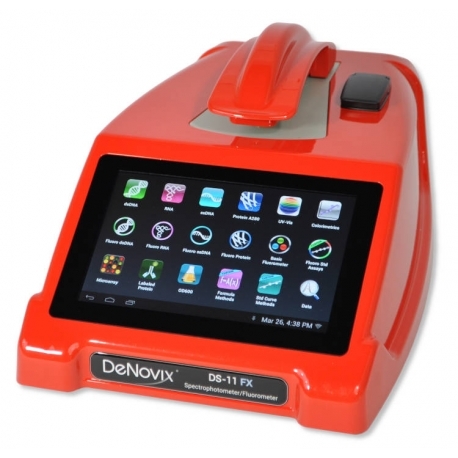 Compare the DeNovix DS-11 Series vs. the NanoDrop™ One spectrophotometer and the Qubit® Fluorometer. Awarded 2017 and 2018 reviewers' choice product of the year and Platinum Seal of Quality 2018. Equip your lab for today’s quantification requirements and for future assay challenges. 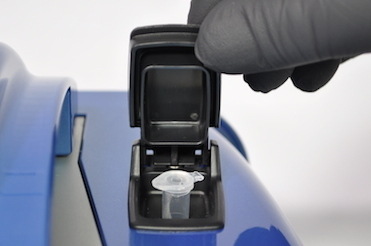 The choice of microvolume or cuvette absorbance and fluorescence methods delivers unmatched flexibility and dynamic range. 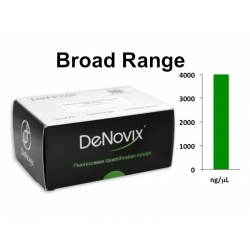 Coupled with the DeNovix dsDNA quantification assays, a range of 0.5 pg/µl to 37,500 ng/µl can be rapidly measured. The patented* DS-11 FX combines unique hardware and software features to deliver unmatched confidence in sample accuracy, performance and reliability. DS-11 FX Series instruments feature the most powerful and intuitive software of its type. 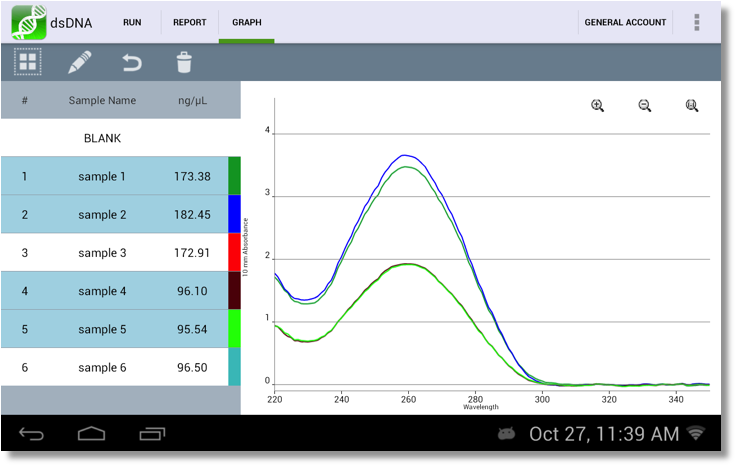 Designed by life scientists, pre-installed EasyApps® and a breakthrough Android™ touchscreen interface delivers error-free operation and sample to data in under 4 seconds. 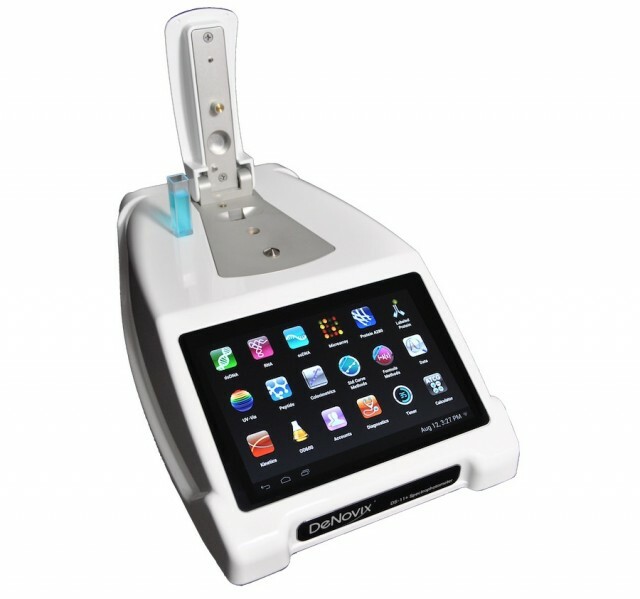 Every instrument is ready to measure right out of the box – no PC set-up or software installation. 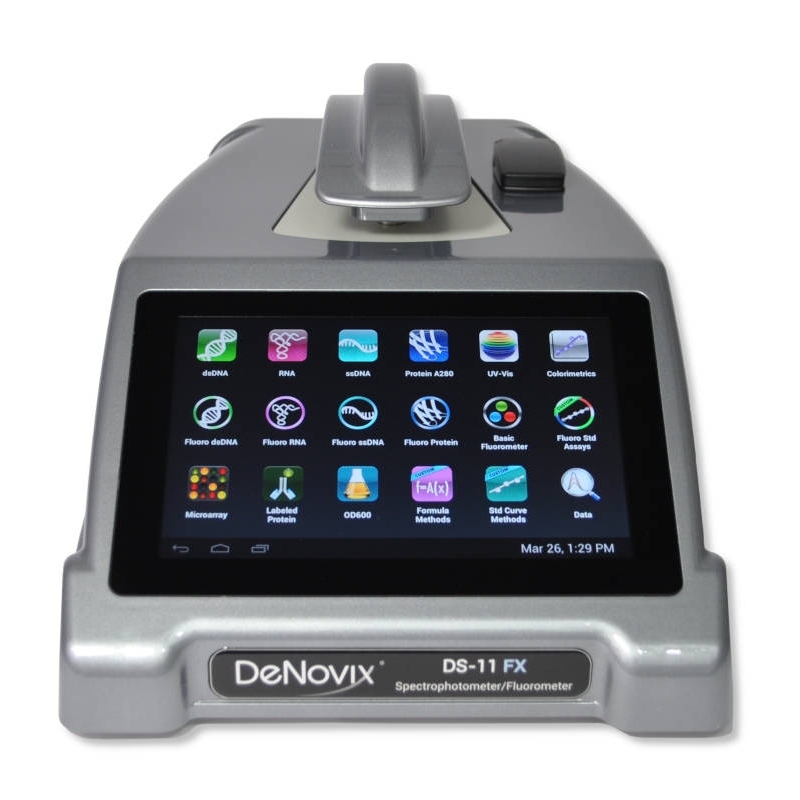 SmartPath Technology is at the heart of all microvolume measurements on the DS-11 FX Series. 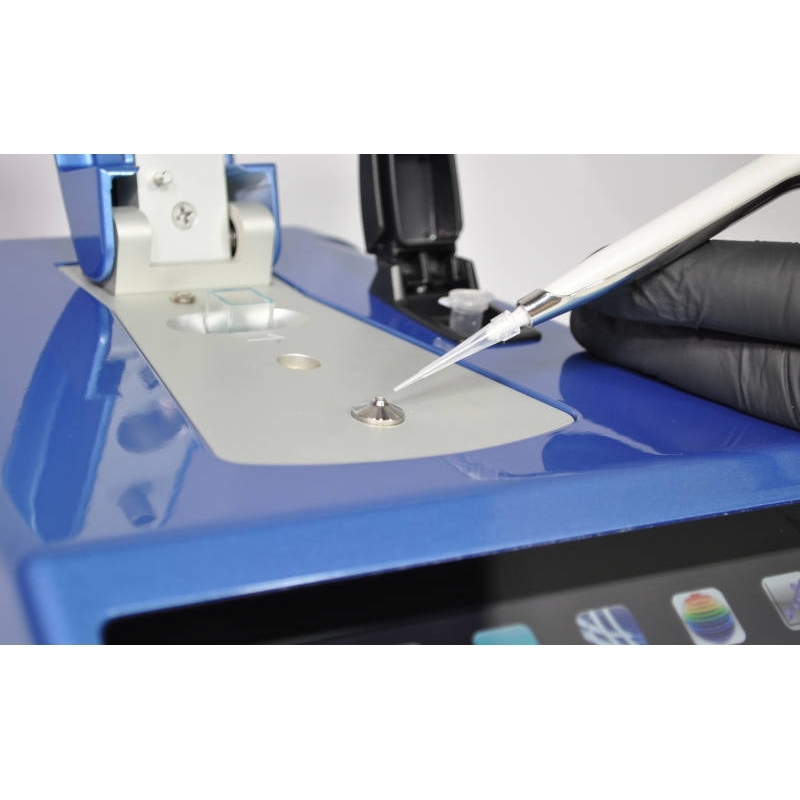 The proprietary algorithms provide ultra-precise by using real-time absorbance feed assessment to determine the optimum pathlength with which to measure the sample. This enables a best-in-class lower detection limit (0.75 ng/ul dsDNA, 0.60 ng/ul RNA or 0.04 mg/ml BSA) and the highest max detection (37,500 ng/ul of dsDNA or 1,125 mg/ml of BSA protein). A major concern for microvolume spectrophotometers, especially those that use a 1 mm pathlength, is sample column breakage. When this occurs, the upper and lower measurement pedestals are not bridged with sample and the measurement will be erroneous by as much as 1,000% (not a typo). The DS-11 FX Series is inherently less susceptible to this since the max pathlength is 0.5 mm and the sample is continually compressed during measurements rather than stretched. 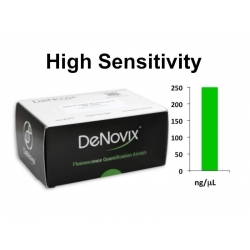 In addition, DeNovix has developed a proprietary algorithm that detects in real-time if the sample column has broken and then compensates to ensure accurate results are achieved with no user action being required. 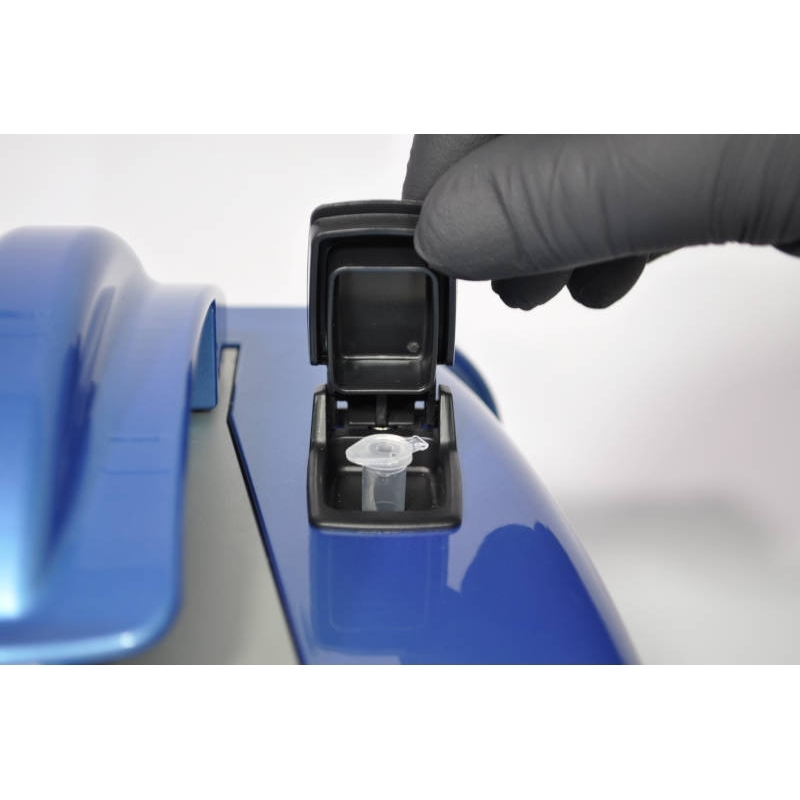 No other microvolume spectrophotometer has this capability and this method is especially beneficial for quantification of low surface tension fluids such as protein samples. You can learn more about BridgeTesting technology in this TechNote. Since the DS-11 FX Series does not rely on fixed path length calibrations and therefore does not require regular calibration checks. There is no downtime or expense required for routine calibration like many other spectrophotometers. DeNovix offers a LC-NA verification standard for labs that may need to verify proper operation from time to time in accordance with their own quality standards. 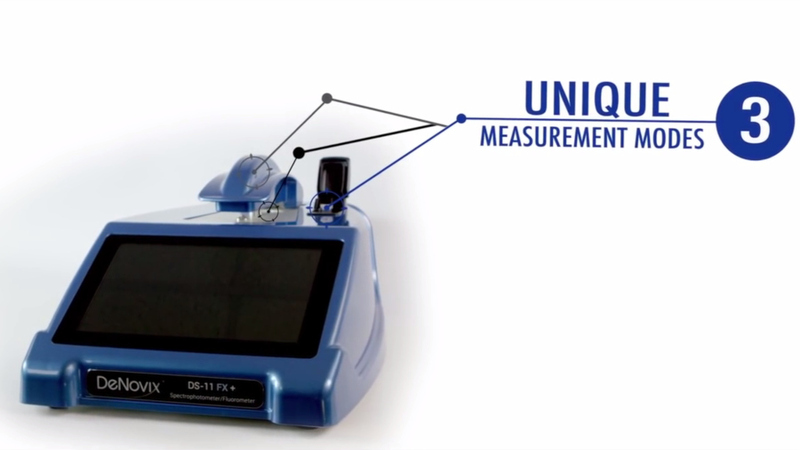 A key feature of the DS-11 FX is that the longest path length used (0.5 mm path) is shorter than the 1.0 mm path used by other microvolume spectrophotometers. This enables the DS-11 FX to truly measure 1.0 ul samples, virtually eliminating the possibility of erroneous results due to sample column breakage. The most sensitive and precise fluorometer of its type provides the ability to run almost any common fluorescence assay. Choose from a wide range of pre-configured kits or create custom applications for total flexibility. 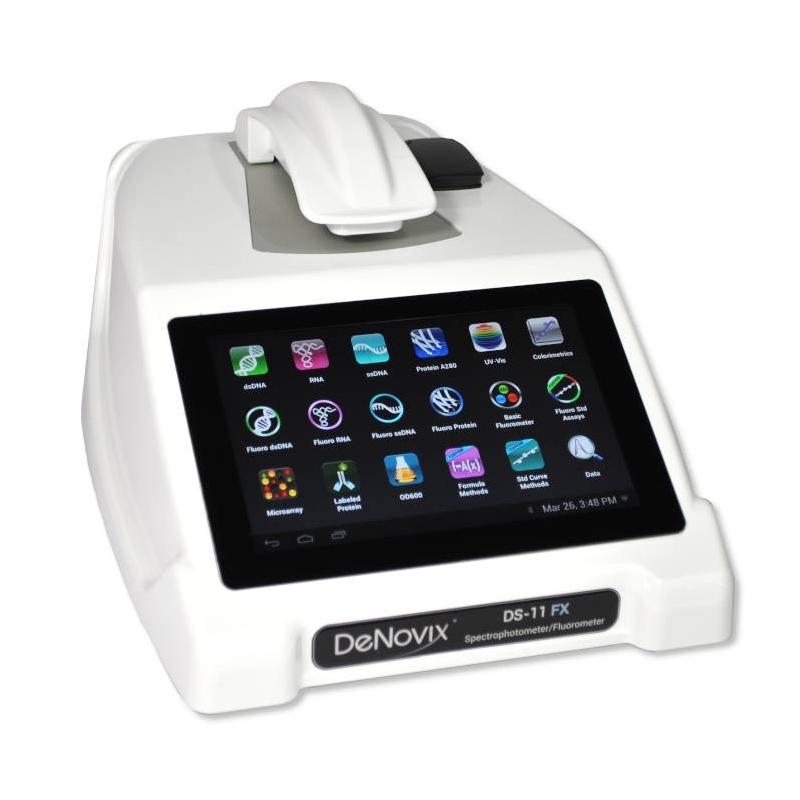 Combine the DS-11 FX with the DeNovix dsDNA fluorescence quantification kits for industry-leading sensitivity and dynamic range. Quantify to 0.5 pg/µl up to 4,000 ng/µl with your choice of three quantification kits. Choose the assay you wish to work with, not the one dictated to you by a fluorometer manufacturer. 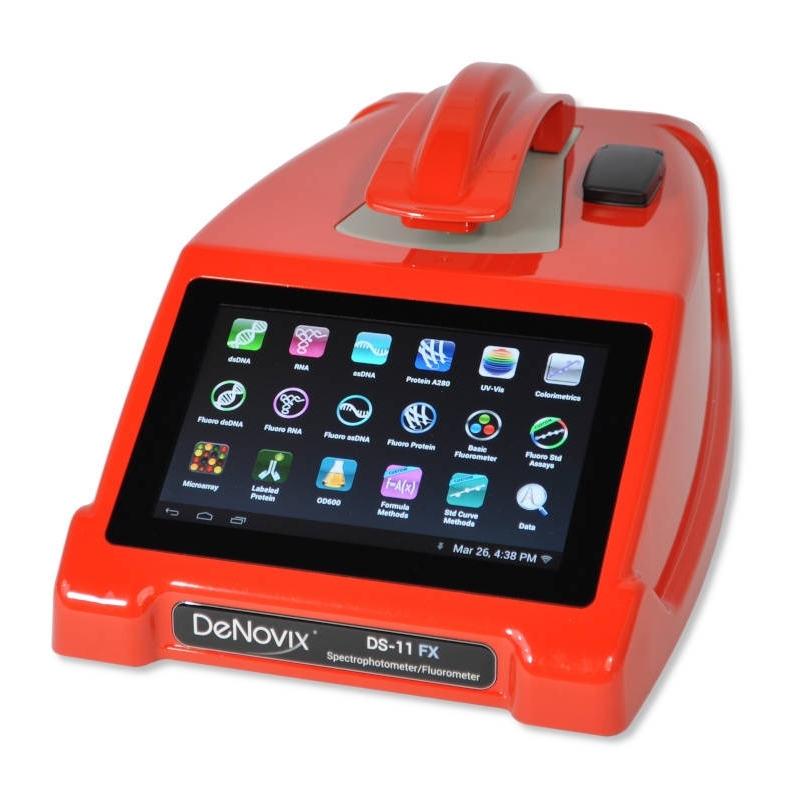 DeNovix EasyApps® are pre-configured with a large selection of commercially available quantification assays. 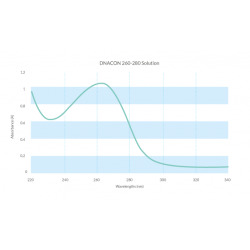 Choose easy two-point standard curve DeNovix Fluorescence Assays or Qubit® and Quantus™ assays for dsDNA, RNA or protein quantification. 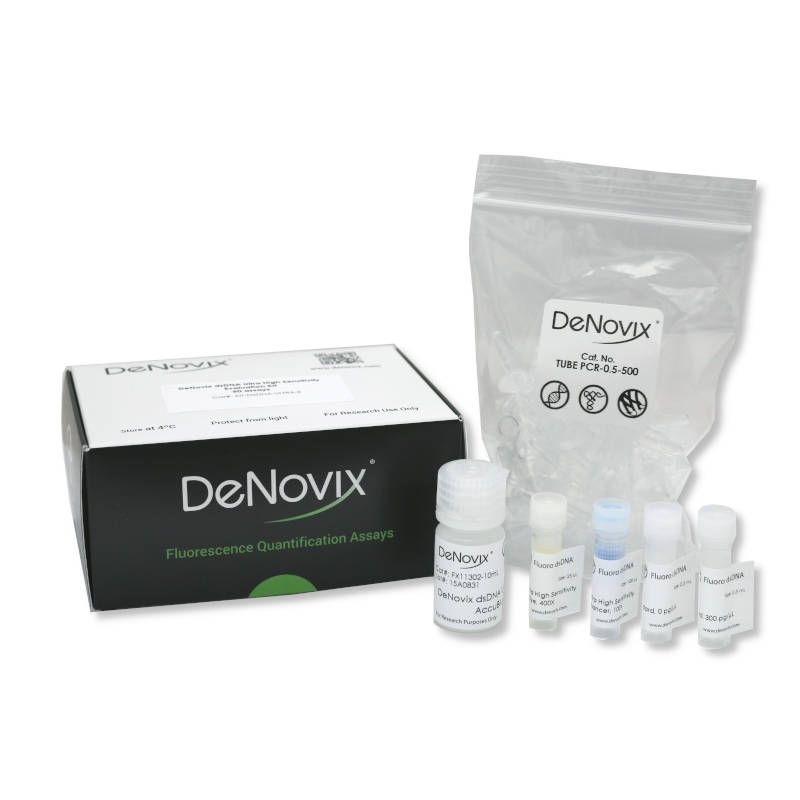 DeNovix Fluorometers include four emission and excitation channels to provide scientists the flexibility to use the fluorophore and detection ranges of their choice. 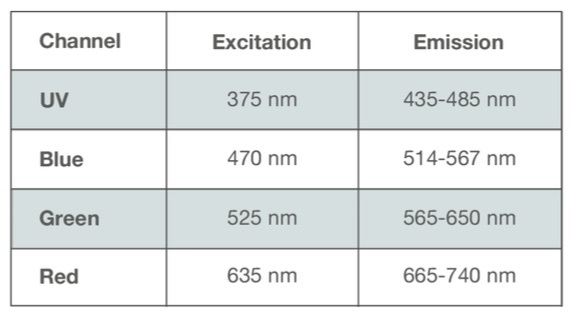 Choose from UV (375 nm), Blue (470 nm), Green (525 nm) or Red (635 nm) excitation sources. Choose from one of these pre-programmed assays, or create your own ! Enables up to 10 mm pathlength measurements using standard quartz or disposable cuvettes extending the UV-Vis lower detectible limit. The built-in cuvette heater controls temperatures for Kinetics studies. These added features provide a full range of UV-Vis absorbance quantitation in a single instrument. Using the 1 cm cuvette mode enables a lower detection limit 20 times below what is available on the microvolume mode of the DS-11 without the use of fluorescent dyes to gain sensitivity. Measure samples with concentrations as low as 0.04 ng/ul of purified dsDNA or 0.002 mg/ml purified BSA in cuvette mode. Create simple kinetics methods measuring two absorbance wavelengths over a user-defined measurement frequency and period. EasyApps® streamlines the process to create and save custom methods and enables cuvette temperature control between 37°C to 45°C. The high-particulate nature of bacterial cell cultures benefit from a longer measurement pathlength. The particulates in these samples scatter light, and a 10 mm pathlength provides a longer cross-section of the sample for the spectrophotometer’s light beam to travel through. This ensures the highest degree of accuracy and reproducibility when measuring these types of samples. Built-in Wi-Fi, Ethernet and USB allows easy export of data you want in the format you need. Email a .csv or color .jpg of your results, save data to LIMS or network drives, print results or graphs to network and label printers and more !